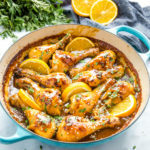 This Easy One Pan Orange Ginger Chicken is a delicious weeknight meal idea - a sticky sweet sauce over tender chicken with fresh orange and ginger! Heat a large oven-safe skillet over medium-high heat and add the olive oil. Pat the chicken drumsticks dry with paper towels and season with salt and pepper. Place the chicken drumsticks in the oiled pan and cook on all sides until golden brown. No need to worry about cooking the chicken through at this point - just get a good golden crust on it! In a medium bowl, whisk together the orange juice, honey, sriracha, hoisin sauce, rice vinegar, soy sauce, cornstarch, sesame oil, ginger and garlic until well blended. When the chicken has browned on all sides, pour the sauce over the chicken evenly to coat and turn off the heat under the pan. Place the pan in the pre-heated oven and bake for about 25 minutes or until the sauce has reduced and thickened and the chicken is cooked through. Baste the chicken with the sauce once during the baking process, if desired. Serve with orange slices, a sprinkling of sesame seeds, and fresh parsley, if desired. This dish is best served with steamed vegetables and rice, but feel free to serve it alongside whatever side dishes you desire.